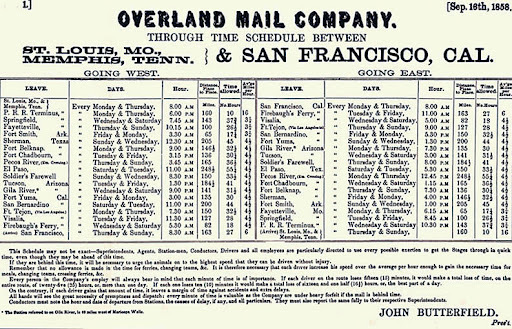 Time Schedule for east- and westbound stages in 1858. 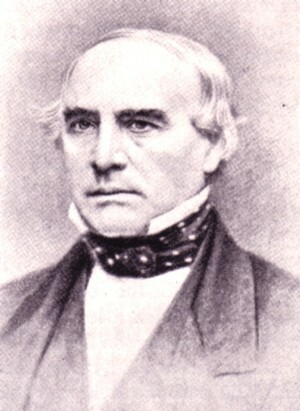 Across the Indian Territory, Butterfield negotiated with the Choctaw and Chickasaw nations to cross from the Choctaw capital at Scullyville southwest to Boggy Depot and then south to the Red River crossing at Colbert’s Ferry.5 The route across northern Texas ran south to Sherman and then southwesterly via Jacksboro, Gainesville and a series of military forts. Then the Butterfield route ran west to the Pecos River and followed its eastern bank north to near the New Mexico border and then west again through the Guadalupe Mountains, southern New Mexico and Hueco Tanks to Franklin, Texas, present-day El Paso.6 The Butterfield Route then followed the mail route established a year earlier between San Antonio, Texas, and San Diego, California, across southern New Mexico and Arizona Territory. In California, however, the Butterfield Route turned north before reaching San Diego, heading toward San Francisco. The route went through the Temecula valley, on to Los Angeles and then north over the mountains surrounding the San Fernando Mission and Fort Tejon before dropping into the San Joaquin valley. The route ran generally from Bakersfield to Fresno, staying in the foothills of the Sierras and then crossing the river at Firebaugh’s Ferry and climbing over the coastal range on a newly built toll road south of San Jose before following well-established roads into San Francisco. Conkling, R.P. and M.B. Conkling. The Butterfield Overland Mail, 1857-1869, Volume I, (Glendale, Calif.: The Arthur H. Clark Company, 1947). A History of the Missouri Pacific, Missouri Pacific Historical Society, MoPac’s First 125 Years. Pea Ridge National Military Park, National Park Service, Elkhorn Tavern. Hendricks, Nancy L. “Butterfield Overland Express,” Encyclopedia of Arkansas History and Culture, (September 2007). Encyclopedia of Arkansas History and Culture; National Park Service, Fort Smith National Historic Site. Wright, Muriel H. “Historic Places on the Old Stage Line from Fort Smith to Red River,” Chronicles of Oklahoma, (Oklahoma Historical Society, June 1930), 798-822, Chronicles of Oklahoma. Texas Almanac, Butterfield Overland Mail.